Overland Park Regional Medical Center is the first and only hospital in Johnson County to offer whole body cooling for infants in its Neonatal Intensive Care Unit (NICU) for our region. The NICU at Overland Park Regional Medical Center includes a multidisciplinary team of neonatologists, neurologists, therapists and nurses to provide care to infants who require whole body cooling. Since 2010, the NICU at Overland Park Regional Medical Center has treated nearly 60 infants for whole body cooling and has a 92% survival rate, well above national and international rates. “The whole body cooling program at Overland Park Regional Medical Center is successful because we provide evidence based care. Our team provides continuous temperature monitoring combined with strict protocols for passive and active cooling allowing for accurate measure control while avoiding severe hypothermia. Our protocol can be safely implemented in air or ground transports. Our NICU also provides a 2:1 nurse to patient ratio for our whole body cooling patients,” says Thomas M Lancaster, MD, Director of the Whole Body Cooling Program at Overland Park Regional Medical Center. Whole body cooling is needed when an infant is born with symptoms of birth-related brain injury that occurs as a result of oxygen deprivation at some point during birth. Whole body cooling is effective in mitigating injury and preventing further brain damage in newborns. 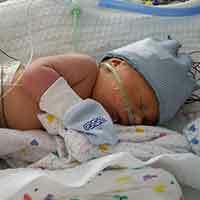 Whole body cooling entails using a specially designed “cooling blanket” on an infant and consists of lowering the newborns body temperature to 33.5 degrees Celsius (92.3 degrees F) for a period of 72 hours. “Research shows that cooling babies deprived of oxygen at birth improves their chances of growing up without disabilities such as cerebral palsy,” says Dr. Lancaster. Patients who undergo whole body cooling are followed for five years in the Overland Park Regional Medical Center NICU and Developmental Pediatrics follow up clinics to examine developmental, social and emotional milestones.